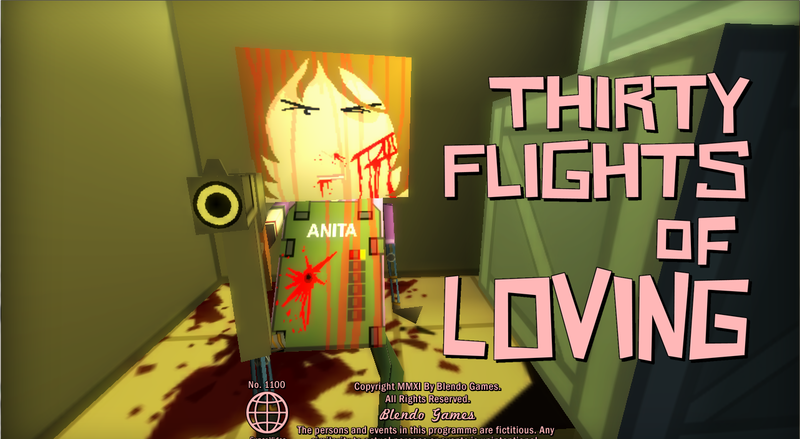 Thirty Flights of Loving is the latest video game by Blendo Games, Brendon Chung's award-wining indie game company. The game is part of his Citizen Abel series. Where can you start? Go to the official web site and click on the link to download Gravity Bone for free at the bottom of the page. It's the prequel to Thirty Flights of Loving and is quite short (although not as short as its TFOL). 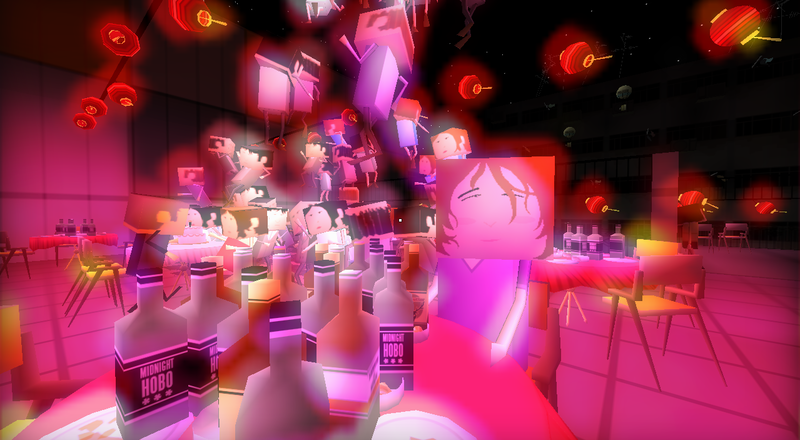 It's also completely unnecessary to play Gravity Bone first, but it's enjoyable and free, so why not? Played Gravity Bone or don't care to? Now for step two: download and play TFOL. It's five bucks and only takes about thirteen minutes to play, so don't tell me you can't afford it or don't have the time. As PC Gamer (one of the industry's top magazines and web sites) puts it, "[Thirty Flights of Loving] Does more with story in 13 minutes than most games do in 13 hours." And that's not an exaggeration. The game also does much more than deliver an excellent story. Read on to find out what this short game does as I dissect it. First, the story. On the front page of the web site, PC Gamer's bold quote stands proudly right next to the "buy now" button. For this reason, many people who check out the game will be expecting a crazy good storyline and will probably not be expecting TFOL's very unconventional narrative structure. There isn't any comprehensible dialogue and there aren't any mandatory cutscenes, the usual video game story devices. The setting, characters and story are mostly fleshed out by the environment in clever ways. 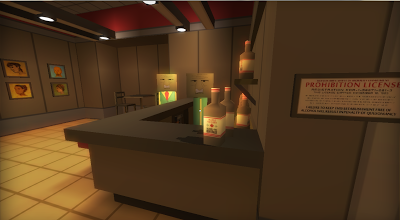 For example, the fact that there's trouble in paradise and an alcohol prohibition can be deduced simply by observing the first hallway and room of the game. Jolting jumps through the timeline of the game are one of the primary story devices the game uses and it certainly stands out. Many films and novels use this technique, but I'm hard pressed to find an example of another game that does. The player is left to figure out the timeline and, to a certain extent, the story itself. Because of this, TFOL was a different, new and fresh gameplay experience. After my first playthrough (under 15 minutes), I wasn't too sure what to think. It's kind of like what happened to me when I was trying to write about To the Moon: it's such a different and unique game experience that it's tough to analyse the same way I do more traditional games. Clocking in at about thirteen minutes, Thirty flights of Loving has no time for fluff. Everything you do is relevant, bizarre and, most importantly, interesting. For a game with a simplistic, unrealistic art style, it has a surprising amount of realistic human moments. Knocking on a particular door and having a man peek out for a moment. Walking around in a public place and hearing a man clear his throat. Getting drunk at a party and stumbling back with a soon-to-be lover. Peeling an orange. For all the mundane details found in the game, there are also many surreal elements. These elements stood out to me since TFOL's dissonant style is uncommon in games. A hallway with accelerated time. Floating dancers. Weird language mixes. And that ending... and the segment after the ending. More on the post-ending section in another post. One particular gag that got me was the malfunctioning stairs. At a certain point in the game, you have to follow your partners to the roof of a building. 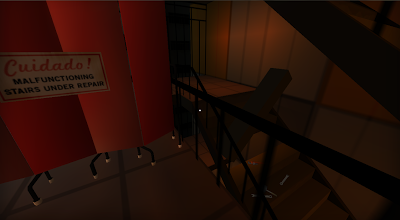 On my second playthrough, instead of going up the stairwell, I went exploring down to find a barricade with a sign reading "Cuidado! Malfunctioning stairs under repair" and a single stair moving up and down continuously. What a funny and creative way for the designer to limit the game space! 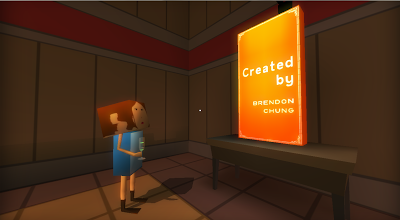 Speaking of the designer, there's a great developer commentary option unlocked upon finishing the game. Chung's comments and insight were interesting to read and gives an interesting inside look at the development of TFOL. Definitely a cool addition to an already intriguing package. 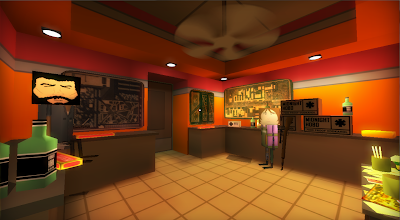 I must admit that I was sort of taken aback by the oddity and the unfamiliar design of the game at first, but after playing through a few times and contemplating the game, it's definitely been an enriching experience and it's now one of my new favorite games. There is just so much content and food for thought crammed into the 13-minute experience. TFOL will definitely stick with me and influence my future projects.